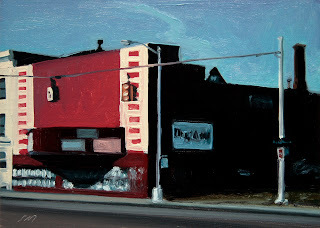 Hamtramck Corner, oil on linen panel, 7"x5", click on image to enlarge. I love these old corner buildings in Hamtramck. 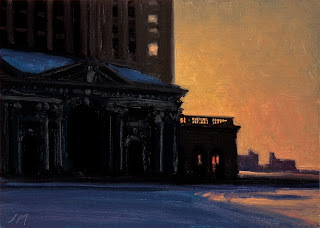 Michigan Central Nocturne, oil on linen panel, 5"x7", click on image to enlarge. Not to much I can say about this other than sometimes you are in the right place at the right time. The Ford Rouge Plant & C.N. 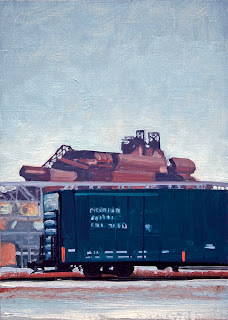 Boxcar, oil on linen panel, 7"x5", click on image to enlarge. Painting of the Ford River Rouge with a Canadian Northern boxcar in the foreground. The Guardian reflected in The Farwell Bldg. window. 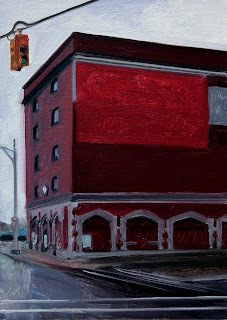 The Marquee, oil on linen panel, 5"x7", click on image to enlarge. The strong shapes and contrasts drew me to this image. 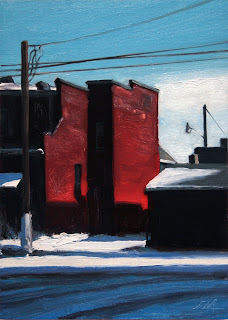 The Vermilion Walls, oil on linen panel, 7"x5", click on image to enlarge. Another winter painting. I loved all the color and contrast in this scene. January sunshine is very limited in Michigan so it was a treat to walk out of the studio and see the sun creating these wonder rich shadows on our neighbors house. Vesuvio's Bakery, oil on linen, 48"x40"
This is a commission I just finished for the George Billis Gallery in New York. 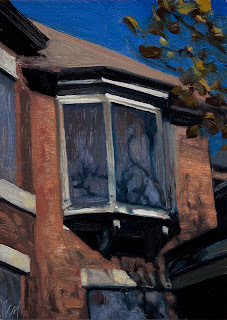 Last Light #2, oil on linen panel, 5"x7", click on image to enlarge. 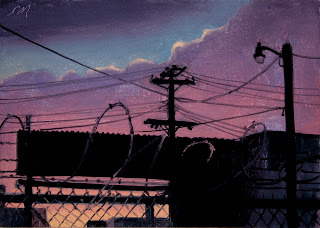 Industrial nocturne, I was interested in the way the dark shapes bulk up against the range of color in the evening sky. Just like watching the sunset on the Gulf Coast at Siesta Key, Florida, right? 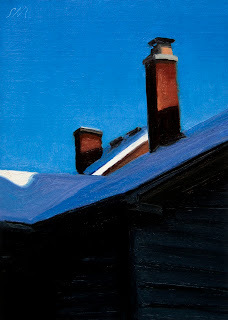 Winter Light, oil on linen panel, 7"x5", click on image to enlarge. The warm winter light really plays well off the cool shades of blue. 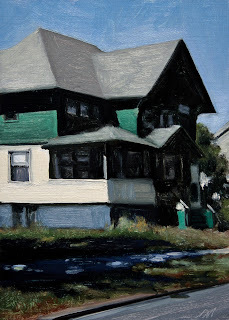 The Verte House with Shadows, oil on linen panel, 7"x5"
Really liked the darkness of the shadows and shaded side of the house playing against the warm light on the sunlite side of the house. 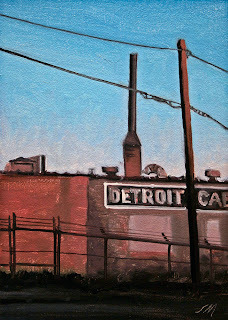 Vernor's Sign, oil on linen panel, 7"x5"
This painting is of the bones of a billboard in Detroit at the Vernor's plant. Vernors was then a locally brewed soda drink. It was made by James Vernor, a Detroit pharmacist. Called to war in 1862, returned 4 years later to oak casks of 19 secret ingredients including ginger and vanilla that had been transformed into the distinctly robust taste of Vernor's ginger ale. Bottling at the Detroit plant was ended in 1985. When I was a child my Grandmother would make us Boston Coolers, ice cream and Vernors, yummy! This is what the sign looked like in it's day. 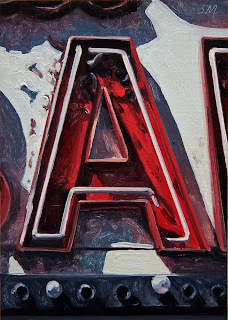 The Detroit Alphabet, letter "A", oil on linen panel, 7"x5"
This is the fourth letter painting in the Detroit Alphabet series. 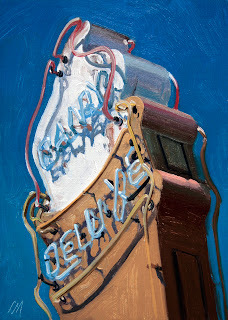 I would like to do a painting of all the letters based on vintage sign-age in Detroit. When the complete Detroit Alphabet is done I would like to make books from the series. I just got Duane Keiser's book published by Blurb and it is very nicely done. I am also planning on doing a book of maybe 100-120 images from 2007 Postcards from Detroit images. This will have to wait a while as I need to update computer systems before I can start. I will keep everyone informed of the progress. Feedback on doing the books would be greatly appreciated. Thanks. Back to the studio. 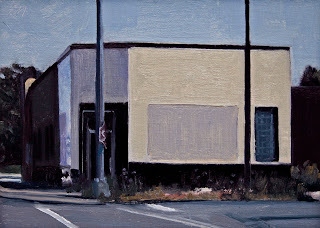 Early Morning Shadow, oil on linen panel, 5"x7"
Interesting boarded up Detroit warehouse. Study in Red & Grey, oil on linen panel, 7"x5"
Dairy Deluxe, oil on linen panel, 7"x5"
The cold grey sky had me thinking about summer and blue skies. So this is an ode to summer. The ice cream store is on Woodward Ave. in Birmingham Mi. A northern suburb to Detroit. Enjoy! 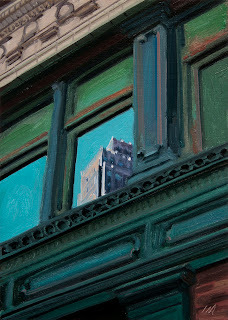 Brush Park Window #2, oil on linen panel, 7"x5"
Another Brush Park painting. This window is part of a very large abandoned apartment. I liked the large planes with shadows created by the plywood cover on the windows with the Catalpa tree leaves and blue sky. Lots of contrasts. Mi. Central R.R. 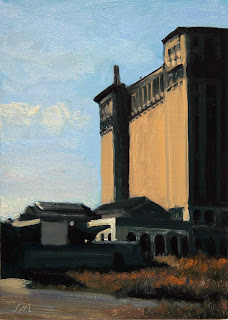 Depot, oil on linen panel, 7"x5"
The Michigan Central R.R. Depot in warm morning sunlight, designed by the same architect who designed Grand Central Station in New York City. A monumental and beautiful building even in it's battered condition. 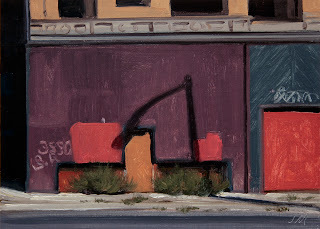 This painting shows the depot before the loading area was torn down. 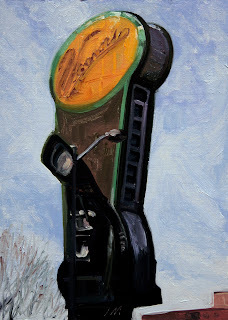 Forest St. Reflections, oil on linen panel, 7"x5"
We were leaving the G.R. N'Namdi Gallery in Detroit a great gallery showing local and international artists, and next door the windows had these beautiful reflections. Very interesting building that I have no information on it's history. 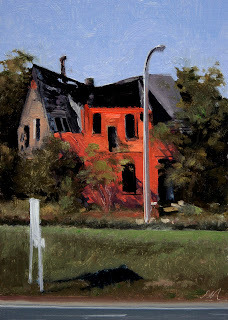 La Maison-Orange, oil on linen panel, 7"x5"
This house is part of Object Orange, founded by Christian Tedeschi, A small group of Detroit artists wanted to draw attention to the abandoned buildings in Detroit, a symbol of defeat, abandon, and neglect. They painted them with "Tiggerific Orange"
interchange. About 15 to 20 houses have been painted, with over half being torn down, some had been standing vacant more than twenty years. 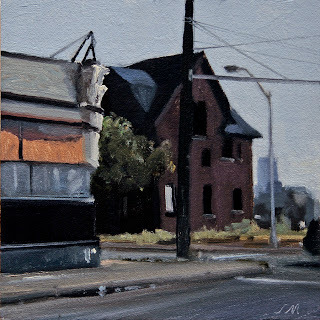 Third & Selden, oil on linen panel, 5"x5"
Another midtown house that is no longer standing, there is a Detroit saying for this, "demolished by neglect"
I am glad I have been recording Detroit with photos and paintings for over twenty five years. So much is gone. I often see a building and think I need to shoot it, going back later to find it no longer there, very sad. It would be OK if it was replaced with another building, but so often it is just gone, another void in our city. 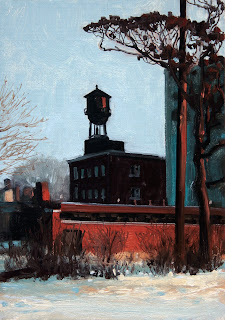 Detroit Blue, oil on linen panel, 5"x5"
Russell Industrial Tank, #2, oil on linen panel, 7"x5"
This is the second water tank in the vast Russell Industrial Complex. The large warehouse is now home to many Detroit artists. This is the 150 th. 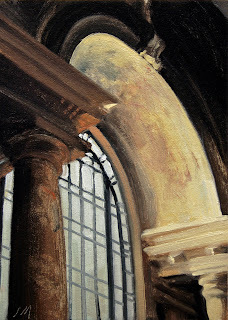 painting posted on this blog. 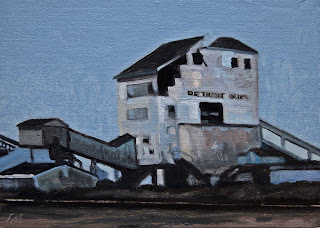 Detroit Mine, oil on linen panel, 5"x7"
This is a painting of the Detroit Salt Mine. It was used to bring salt to the surface. I am not sure if it is still standing. 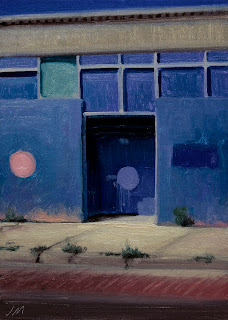 Woodward Ave Blue, oil on linen panel, 7"x5"
Another abandoned building on Woodward Ave. this one with two Tyree Guyton "Dot's". Tyree is a famous Detroit artist, his Heidelburg Project is known around the world. Please look him up for more information. He has been documenting or marking abandoned buildings with brightly colored polka dots. 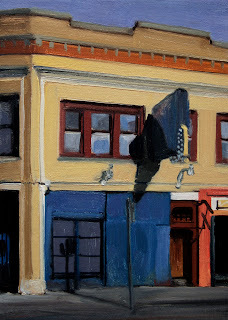 Midtown Blues, oil on linen panel, 5"x7"
There are so many small storefronts scattered all over Detroit. This is one of my favorites, I like the simplicity and yet complexity of the structure. Trying to find color where there is little, you really have to look and see, and that is what it is all about, seeing, I hope you enjoy the beauty in these everyday scenes of Detroit. 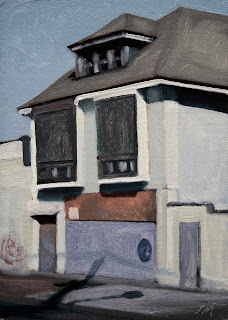 Shades of Grey, oil on linen panel, 7"x5"
Another abandoned building, this one with a Tyree Guyton Dot. Tyree is a famous Detroit artist, his Heidelburg Project is know around the world. Please look him up for more information. 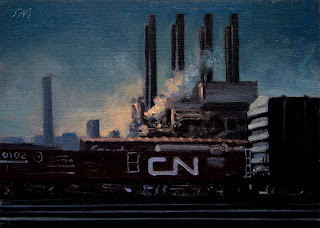 River Rouge Nocturne #2, oil on linen panel, 5"x7"
This is the Ford River Rouge Plant. Construction began in 1917, and was completed in 1928. At that time it was the largest integrated factory in the world. It is a famous complex. Charles Sheeler photographed and painted the complex in the 20's and 30's, and Diego Rivera depicted it in the murals in the Detroit Institute of Arts, the complex has been documented in photos most recently by the photographer Michelle Andonain. Michigan Central R.R. 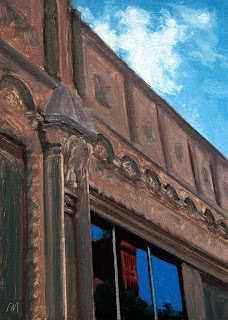 Depot, Arch, oil on linen panel, 7"x5"
This is a detail of one of the front window archs in the Michigan Central R.R. Depot, designed by the same architect who designed Grand Central Station in New York City. A monumental and beautiful building even in it's battered condition. 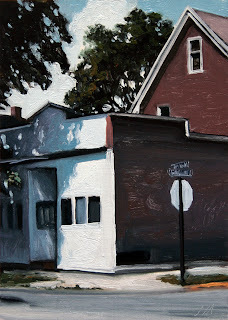 The Blue Doors, oil on linen panel, 7"x5"
Another typical Eastside Detroit building. 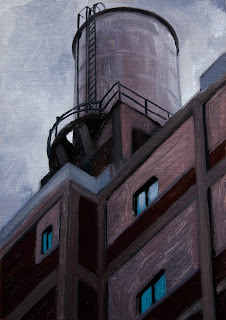 Ford Model "T" Plant, oil on linen panel, 5"x7"
This is the Albert Kahn designed Highland Park Plant, built in 1909. It was the first plant to have an assembly line and was the beginning of mass production, The famous Ford Model "T" was made here and by 1927 when the Model "T" was phased out , over 15 million had been produced. 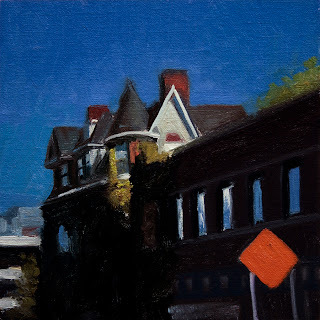 Detroit Cab, oil on linen panel, 7"x5"
I like the way late afternoon light gives everything including the most mundane subjects a glow and life of their own.